I have a small shop inside a 16’ x 20’ shed that I built. 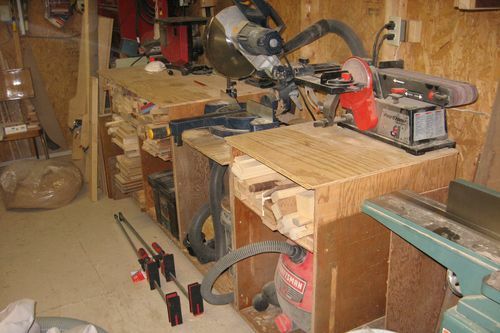 Since the shop is small almost all of my tools are on casters or mobile bases. My table saw is an old Craftsman that I picked up from cl. I plan on replacing the fence with a Delta T2 soon, hopefully. My planer is a Dewalt 12 1/2 in that I mounted on a shop made mobile cart. 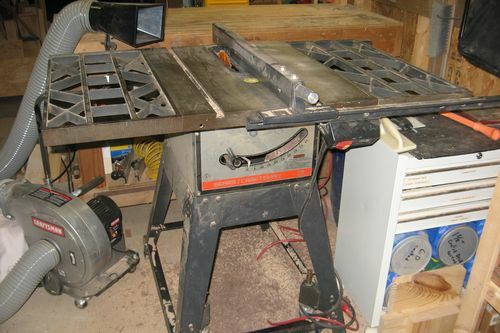 My jointer is a Bridgewood that I also picked up from cl thaks to my brother. It has a 45 in table length and a 6 in width. I keep it tucked away in the corner on a mobile base. 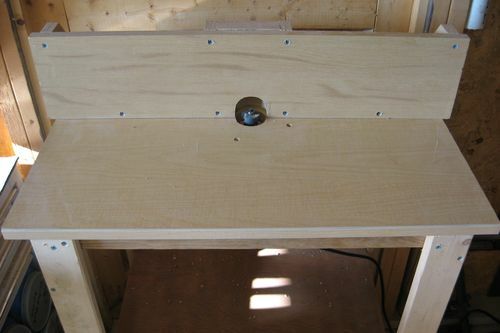 My router table is also shop made. 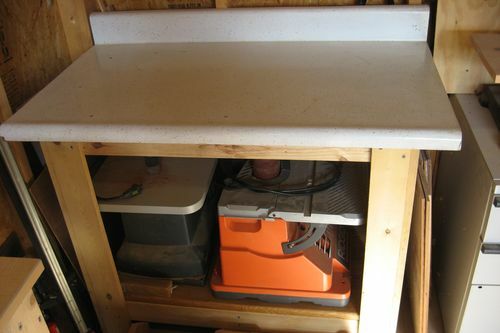 It holds a bosch lift that fits the bosch motor I have for my fixed and plunge bases. 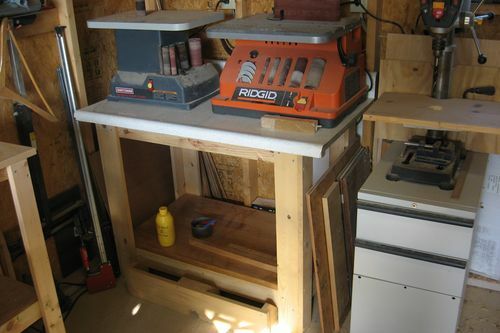 My drill press is a Ryobi bench top that my brother got for me. It is fitted with an axillary table for drilling and sanding operations. My miter saw is a 10in sliding GMC that I got a few years ago as a gift from my in-laws. I built a miter saw station with storage shelves that the saw is mounted to. 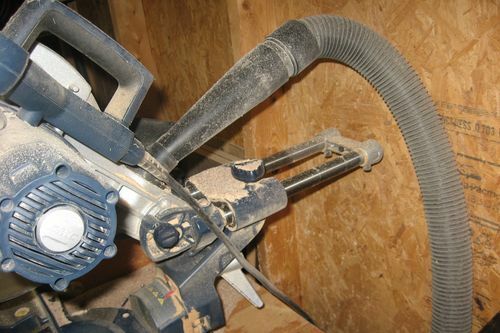 I have my shop vac on a shelf underneath beside a shop built dust seperator that runs to the saw. 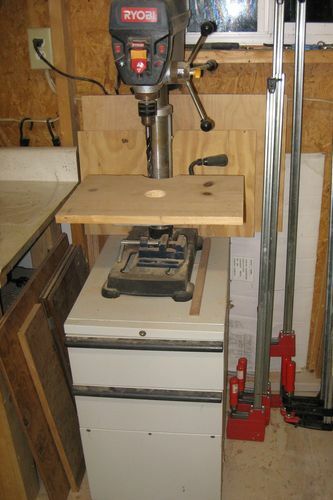 I also have a bench top band saw that my wife gave to me as a gift a few years ago. 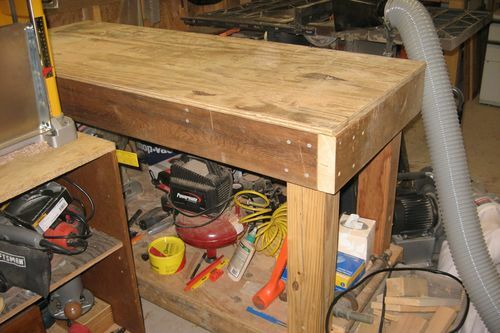 I have an assembly table positioned so that it works as an outfeed table for my table saw. 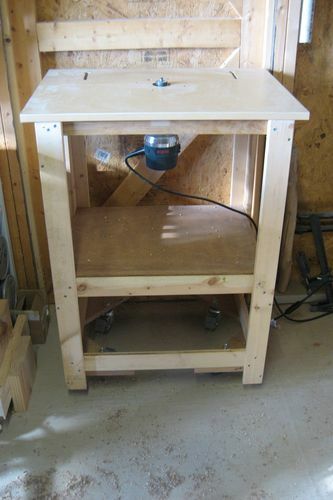 I also have a sanding station that doubles as a glue up station when I put the sanders on the shelf below. 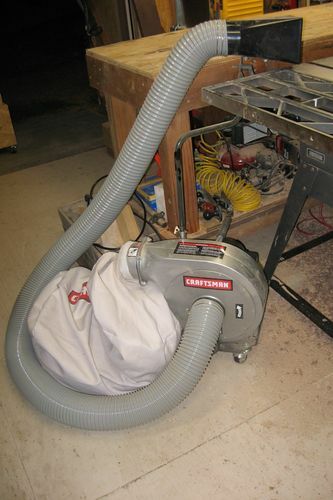 I also have a Craftsman dust collector for the planer and jointer. 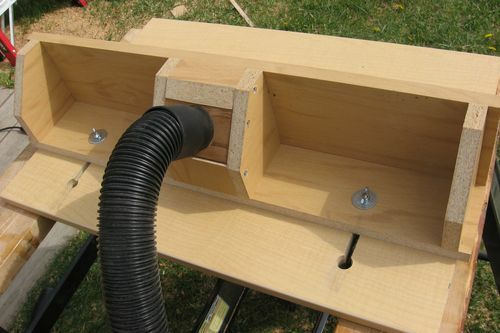 When I first started woodworking all I had to build with was a 7 1/4 in circular saw, an air brad nailer, a few cheap clamps, and a small router table. You probable noticed some of the pics are outside. I like to move outside for room and fresh air when the weather is nice. One of the perks to having tools on mobile bases. I guess I’ve come a long way. So thats what I have now, I’m always dreaming of upgrades. Thanks for looking. Hey very nice! I am just finishing my planer stand and will post some pics soon. We have definitely both come a long way since we first started woodworking! Nice pics Kevin. The first table saw that I bought new was a craftsman. Used it for a long time. Enjoy the journey.! Looks like your shop is coming together nicely ,it all happens one tool at a time. FWIW. My shop is 18×20 and I have to share it with bicycles, lawn mowers, barbecue grills and the like… I would LOVE a dedicated 16×20 building for a shop! Kevin, you have a nice shop. Mine has about the same sq footage – maybe even less. A small shop is big enough to do a lot of things. Hey – maybe we can’t build a boat – but I’m so thankful for my shop as I know that you must be for yours also. Congratulations on your shop and I hope that you are enjoying yourself on Lumberjocks. Welcome and have fun. Thanks everyone, great tips and its nice to know that other people are able to do the wood working the want in a small shop as well. 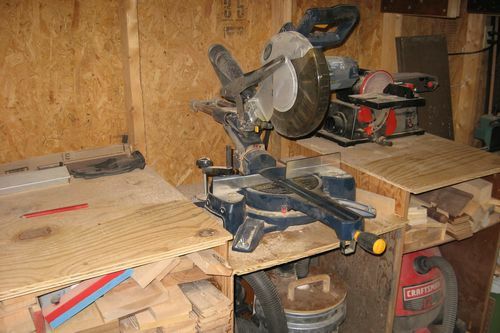 Nice shop, I have a similar 1972 Craftsman 12” table saw that my dad gave me when he upgraded, the fence upgrade made a big difference but it’s a great saw. 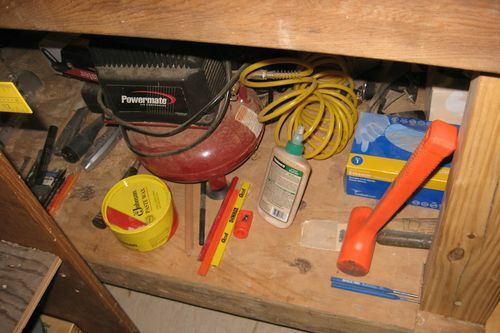 Looks like you’ve got a good set of tools, and a nice space for them, enjoy! ps. that planer looks Very familiar! I agree with you on the “everyting is on wheels”! I have everything on wheels also! Love that joiner you have there too!! You have some nice tools!